Vrindavan: Marking the beginning of the festive season Star Bharat presents, RadhaKrishn, a timeless narrative of one of most celebrated love sagas in Indian culture starting from 1st October at 9 pm time band. RadhaKrishn is an exemplary journey which will allow audiences far and wide, from all walks of life, to experience, understand, and learn the true meaning of love. It will appeal to every generation of viewers through its creative story-telling, musical score, choreography, and visuals. The magnum opus is produced by Siddharth Kumar Tewary under the umbrella of Swastik Productions. Renowned music director Surya Raj Kamal’s original and soulful compositions add to the charm. As testimony to this, the first glimpse of the show – the captivatingmusic video- went massively viral, being shared by millions across the country to wish one another for Janmashtami. The grandeur of the show comes from the 5 sets that have been created for each world – Golok, Vrindavan, Gokul, Barsana and Kans Mahal – after in-depth research, to present RadhaKrishn’s journey against a truly enchanting backdrop. Ace Bollywood choreographer, Chinni Prakash along with his wife Rekha Chinni Prakash add to this musical journey through traditional dances and Raas Leela, curated to depict the enriching experiences and emotions of love. To complement the grandeur of this love saga, Star Bharat will showcase the immoral representation of RadhaKrishn’s love – Krishn’s Bansuri. The channel will initiate a first of its kind – “Bansuri Yatra”- across 100+ towns and cities, through the heartland of the country, for all to see. The 10-foot, golden Bansuri, adorned with peacock feathers, will begin its journey at the birthplace of Krishn where it will be blessed by 151 pujaaris, after which it will provide an immersive consumer experience to those in its path; transporting one back to the era of RadhaKrishn. 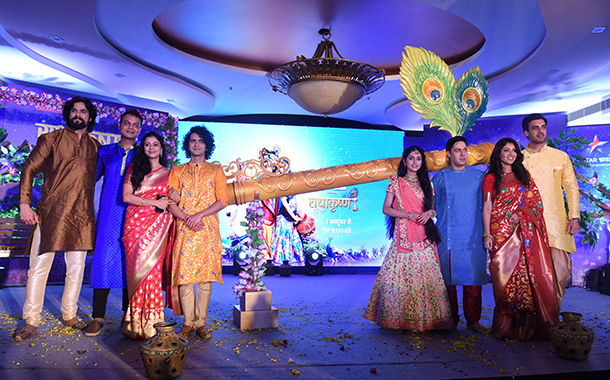 The Bansuri was unveiled today by the cast in Vrindavan, kick-starting the auspicious journey of RadhaKrishn in presence of the entire ‘RadhaKrishn’ cast and crew. They all gathered to celebrate the launch of the show in the holy land of Vrindavan. RadhaKrishn will air every Monday to Saturday at 9 pm from 1st October on Star Bharat. The show features Sumedh Mudgalkar as Krishn and Mallika Singh as Radha.